I made pumpkin pie for Thanksgiving potluck and it has been sitting in the drafts ever since, couldn't post it till day. For the potluck, friends wanted pumpkin pie and I haven't baked it before. 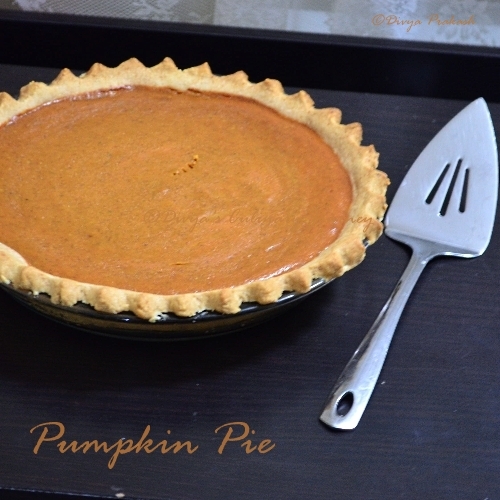 So wanted a simple and easy recipe and browsed for it and got the pie crust recipe here and the pie recipe here. It turned out really good and earned me a lot of appreciation. Only thing I regret is that I don't have good pictures of the pie. It was dark by the time the pie was ready and after the dinner, with the leftover pie took some pictures in the morning. I know the pictures didn't come out well and is not doing justice to this delicious pie. 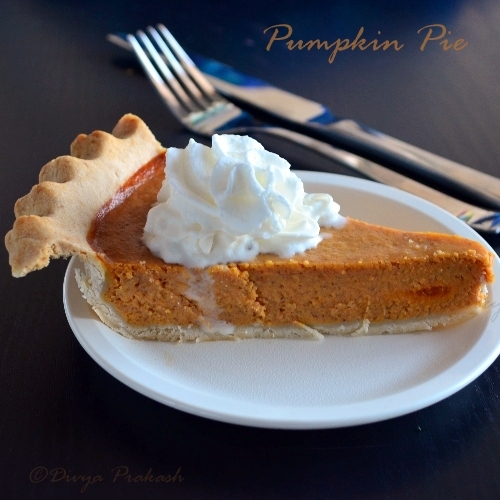 This may not be the authentic pumpkin pie recipe, but if you are looking for a simple, easy to make yet delicious pie, this is the recipe. In a food processor combine flour, salt, sugar and baking soda. Chop the cold butter and add them into the food processor and pulse till they mix well with the flour. Sprinkle ice cold water little by little and keep pulsing till the dough sticks together and rolls into a ball. Keep the dough in refrigerator till it is ready to use for atleast half an hour. If kept in refrigerator for a longer time (say a day before or 6 hours before) keep it at room temperature for at least half an hour before rolling it. With a floured roll pin, roll the dough at least 2 inches larger than the inverted pie plate. Then place the rolled dough on the pie plate, press the dough on the sides and bottom of the plate. Trim the excess dough with kitchen shears and shape the edges. Let it sit for sometime in the refrigerator till you make ready the filling. Whisk together pumpkin puree and condensed milk, add the spices, salt and also beat in the eggs and mix well till they form a smooth mixture. Pour this mixture into the pie crust and bake for 15 minutes. Now reduce the oven temperature and continue to bake for another 30-40 minutes or until the fork inserted comes out clean. Let them cool. Serve it with dollop of whipped cream or as desired. If you don't want to bake the pie crust, you can buy ready made crusts that are available. Instead of the ground spices, you can add two teaspoons of pumpkin pie spice. While baking, cover the pie with silver foil . The baking time varies with oven to oven. The second cycle took around 35 minutes in my oven. I turned off the oven and let it sit inside for another 5 minutes, before I took it out and cooled it on a cooling rack. Beautiful pumpkin pie. I haven't made one yet. Very healthy and delicious pie.. I want a bite of this.....so so delicious it looks. My god it looks so delicious...nice clicks. I too had planned to bake a pie, looking for a pie bakeware. liked all your clicks.. very delicious pie..
Beautiful pie,perfectly made..love the pics. Such an elegant,beautiful and very attractive pie. very nicely plated pie!I love the warm winter flavors. 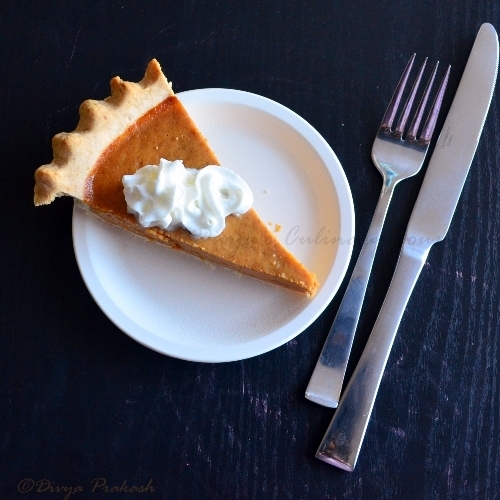 Though I am not a big fan of pumpkin pie, this looks awesome, so perfectly done.. Delicious pie... love the colour..